Senator Bill Brown, cabinetmaker and trade union official, was a gracious and popular figure in the Senate, albeit an outspoken and passionate one. He was born William Walter Charles Brown in the Melbourne suburb of Brunswick, on 4 December 1920, the second child of William Samuel Brown, a French-polisher, and Eileen, née Ryder. After attending Catholic schools in inner-city Melbourne and studying at night school, Bill was apprenticed as a cabinetmaker at the firm of Burge Bros at the age of fifteen. He joined the Federated Furnishing Trades Society of Australasia (FFTSA), and two years later he was a shop steward. Brown was radicalised early in life. He recalled that his father was blackballed by furniture manufacturers for his union activities, and that his mother had to work as a cleaner for five years to support the family. On 13 December 1941, Bill, now a qualified cabinetmaker, married Winifred Mary (Peg) Boyle, a textile worker, in St Paul’s Catholic Church, Coburg. As cabinetmaking was a ‘reserved’ occupation, Brown served in the Citizen Military Forces from 5 November 1941 until 27 August 1942, when he was released to join the AIF. He served with the 16th Field Regiment and rose to the rank of sergeant before his discharge on 9 January 1946. After the war, Brown worked with the furniture-making firms of Branchflowers in the city, and Decro at Coburg. Known in his trade as a ‘perfectionist’ and a man of principle, he became increasingly active in his union, and by 1950 was on its committee of management. By 1954 he was an FFTSA state organiser. When his father, who was FFTSA branch secretary, died in 1959, Brown took over the position, serving until 1969. He served as the union’s vice-president from 1969 to 1975, and president from 1975 to 1978. He also represented the FFTSA as federal secretary, 1964 to 1969, and federal vice-president from 1969. Brown was elected president of the Melbourne Trades Hall Council in June 1961 and was a member of the Victorian Apprenticeship Commission from 1962 until 1965. In 1963 he attended an International Labor Organisation Conference in Geneva as an ACTU delegate. In 1961 he was editor of the Furnishing Trade Society News. At the age of six Brown had helped his father distribute ALP pamphlets, and he joined the party as a young man. In 1965 he was elected Victorian branch president, serving until 1968. A member of the Federal Executive from 1966 until 1970, he was federal vice-president from 1969 to 1970. By October 1969 he had been chosen to head the Senate team for the 1970 Senate election. The death of Senator Sam Cohen in Adelaide on 7 October 1969 created a casual vacancy, which Brown filled, taking up his seat in the Senate on 16 November, serving until the next election, on 21 November 1970. Brown came to the Senate as a representative of the socialist left in the Victorian ALP, a faction described as preferring ‘puritanical adherence to what they considered socialist and radical principles to the pursuit of parliamentary power’, and that had dominated the Victorian branch since the Split. He was a follower of Dr Jim Cairns, an MHR since 1955 and a future Labor minister. Brown and Cairns united to oppose the party reforms instigated by Gough Whitlam, who planned to intervene in the internal organisation of the Victorian branch. Matters came to a head in August 1970, at a meeting of the ALP’s Federal Executive held in Broken Hill, when Clyde Cameron, left-wing power broker, switched sides and supported intervention. Brown (Cameron later wrote) went ‘absolutely berserk’, declaring that it made him ‘vomit’ to have to sit at the same table as such a turncoat as Cameron. At the same meeting Mick Young declared that Brown should be dropped from the party ticket for Victoria. On 14 September the Victorian executive was replaced by a new executive, but Brown retained his Senate place, topping the Victorian poll at the election in November. Brown was not due to commence his six-year term as a senator until 1 July 1971, so for some six months he helped organise trade union support to enable the ACTU to join the FFTSA as a joint owner of Bourke’s, a discount retail store in Melbourne. Following Labor’s victory at the House of Representatives election in December 1972 he became the first Caucus chairman under the new procedures initiated by Whitlam, which included separating the role of chairman from that of party leader. Brown became chairman at a time when there were significant changes in the rules governing relations between Caucus and Cabinet, the effect of which was to reinforce the principle that Caucus was sovereign. This view, which exemplified Brown’s attitude, was not shared by Whitlam. Brown applied the rules ‘with diligence’. With tensions increasing between the two bodies, a confused Caucus meeting took place on 23 July 1974. The next day, Brown announced to the party that he did not concede that ‘the Cabinet is a group of Members commissioned to act independently of the Federal Parliamentary Labor Party as a whole’, a statement that led Senator Reg Bishop to propose, unsuccessfully, that the chairman’s remarks not be recorded. Given the strength of Brown’s views on Caucus sovereignty and the divisions within the Cabinet and Caucus at this time, it says a great deal for him that he managed to continue as Caucus chairman until May 1978. Clyde Cameron regarded Brown as ‘easily the best Chairman of Caucus since Ben Chifley’. In the Senate, as in his party and public life, Brown strongly opposed the Australian military commitment to the war in Vietnam. He also took part in anti-war rallies and demonstrations, making press statements, and speaking on radio and television. In 1971 Brown used Question Time as a forum for his anti-war views, frequently asking questions of the Attorney-General, Senator Greenwood, especially on controversial issues, such as the behaviour of the Commonwealth police, who had placed under surveillance the premises of Students for a Democratic Society in Carlton, and raided the University of Melbourne’s Union House. Two days after the ALP’s 1972 victory, with Whitlam, as the new Prime Minister, about to release gaoled draft resisters, a photograph appeared in the Melbourne Herald showing Brown, in his Melbourne office, encircled by ten draft resisters, all wanted by the Commonwealth police for failing to obey national service call-up notices. On 28 December, in a joint press release with Cairns, now Minister for Overseas Trade and Minister for Secondary Industry, Brown denounced ‘the re-escalation’ of the American bombing of North Vietnam as ‘brutal, indiscriminate slaughter of defenceless men, women and children’, and called for a peaceful settlement to the conflict. Two years later, on 14 November 1974, Brown joined a self-appointed committee of Government ministers and backbenchers that urged the Whitlam Government to recognise the provisional revolutionary government of the republic of South Vietnam, the political arm of the Viet Cong. Connected with Brown’s opposition to the war in Vietnam was his absolute stand against all American military installations in Australia. Interviewed on ABC Television’s This Day Tonight, Brown informed Richard Carleton that he would be lobbying within the Victorian ALP, at its forthcoming annual General Assembly, against a proposed Omega base in Bass Strait. Late June saw him in Hobart addressing the Tasmanian Association for International Co-operation and Disarmament, on the same topic. 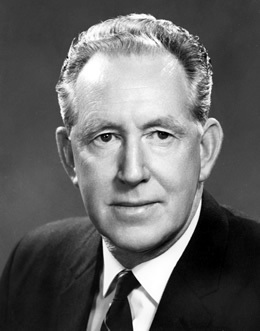 Shortly after the double dissolution election of 18 May 1974, Brown, who was again in first place on the Victorian ALP Senate ticket, went on the attack against the American alliance and, in particular, the United States Ambassador to Australia, Marshall Green. He described Green as ‘the top U.S. hatchet-man’, who, he said, was in Australia simply to protect American financial interests, and the maintenance of US military installations. Whitlam at first tried to ignore the situation, then, under pressure, publicly rebuked Brown. It seems that if he had not, the US State Department had intended to recall Green to Washington and to replace the Ambassador with a chargé d’affaires. The Age called into question Brown’s fitness to continue as chair of the Federal Parliamentary Labor Party, but there is little doubt that Brown’s comments reflected the views of other left-wingers within the ALP. Brown was re-elected in 1975, although he polled only 757 first preference votes. He was placed third on the Labor ticket in September 1976, behind the 32-year-old Gareth Evans, and John Button. He lost support within his own faction, which split its vote between Brown and former Victorian secretary, Bill Hartley. The old order to which Brown belonged was almost gone. At the general election of 10 December 1977, he was defeated. Brown’s retirement was long, chronic ill health preventing him from further involvement in Labor politics. He died at a nursing home in Greensborough on 26 June 2001. Cremated at Fawkner Crematorium and Memorial Park, he was survived by Peg, and their five children. Bill Brown is a thorough gentleman. Whenever there have been people appearing to give evidence before a committee who have been the slightest bit nervous—and sometimes Senate standing committees can be a bit awe inspiring—he was able to make them feel entirely at home and completely relaxed … Bill, we will miss you very much on our committees’. Sunday Press (Melb. ), 30 June 1974, p. 7; Furnishing Trades Society News (Melb. ), Dec. 1969, pp. 3, 6; Brown, William Walter Charles—Defence Service Record, B883, VX102059, NAA; Furnishing Worker (Melb. ), Feb. 1950, p. 1, Dec. 1950, p. 3; Furnishing Trades Society News (Melb. ), Feb. 1960, p. 3, June–Aug. 1969, p. 3, June 1961, p. 27, Mar. 1967, p. 5, Aug. 1973, p. 11. Sunday Press (Melb. ), 30 June 1974, p. 7; ALP, Federal Secretariat, Federal Executive minutes, 27 July 1966, box 120, folder 40, 6 Aug. 1970, box 121, folder 48, MS 4985, NLA; Age (Melb. ), 9 Oct. 1969, p. 3; Australian (Syd. ), 20 Nov. 1969, p. 3; Alan Reid, The Whitlam Venture, Hill of Content, Melbourne, 1976, p. 40; John Faulkner and Stuart Macintyre (eds), True Believers: The Story of the Federal Parliamentary Labor Party, Allen & Unwin, Crows Nest, NSW, 2001, p. 109; Clyde R. Cameron, The Confessions of Clyde Cameron 1913–1990, as told to Daniel Connell, ABC Enterprises, Crows Nest, NSW, 1990, pp. 187–8, 190; Age (Melb. ), 19 Dec. 1970, p. 11. Faulkner and Macintyre, True Believers, pp. 110–14, 291; Clyde Cameron, The Cameron Diaries, Allen & Unwin, North Sydney, 1990, p. 634. Tom Uren, Straight Left, Random House, Milsons Point, NSW, 1994, p. 183; CPD, 11 Mar. 1970, p. 208, 21 May 1970, p. 1663; Herald (Melb. ), 30 Sept. 1971, p. 3; CPD, 28 Sept. 1971, pp. 877–8, 29 Sept. 1971, pp. 935–6, 30 Sept. 1971, pp. 1009–10, 5 Oct. 1971, pp. 1084, 1090–1, 1093–4, 6 Oct. 1971, p. 1154, 7 Oct. 1971, pp. 1228, 1230, 10 Nov. 1971, p. 1811, 23 Nov. 1971, pp. 1980–1; Herald (Melb. ), 4 Dec. 1972, p. 6; Joint press release, Dr J. Cairns and Senator Bill Brown, 28 Dec. 1972, Brown file, CPL; Age (Melb. ), 29 Dec. 1972, p. 3; Courier-Mail (Brisb. ), 14 Nov. 1974, p. 8. Omega Base interview with Senator Bill Brown from This Day Tonight, 22 Mar. 1973, Brown file, CPL; Mercury (Hob. ), 29 June 1973, p. 6. SMH, 17 Apr. 1974, p. 8; Press release, W. W. C. Brown, 18 May 1974, Brown file, CPL; Age (Melb. ), 26 June 1974, p. 1; Sunday Observer (Melb. ), 30 June 1974, p. 4; Age (Melb. ), 3 July 1974, p. 3; Cameron, The Cameron Diaries, pp. 494–6, 500–2, 524–6; CPD, 4 May 1977 (R), pp. 1525–6, 5 May 1977 (R), pp. 1669–70. Keith Scott, Gareth Evans, Allen & Unwin, St Leonards, NSW, 1999, p. 78; Cameron, The Cameron Diaries, p. 233; Sun News-Pictorial (Melb. ), 18 Sept. 1976, p. 11; CT, 20 Sept. 1976, p. 3; Australian (Syd. ), 26 Aug. 1976, p. 3; Herald Sun (Melb. ), 27 June 2001, pp. 70, 73. CPD, 10 June 1978, pp. 2780–94. This biography was first published in The Biographical Dictionary of the Australian Senate, vol. 3, 1962-1983, University of New South Wales Press Ltd, Sydney, 2010, pp. 86-89.